check: saddle between 460 and 470 contour ?? How to get there: The trailhead is in the small village Lama. First locate Ponte Leccia north of Corte. This is where Hwy. 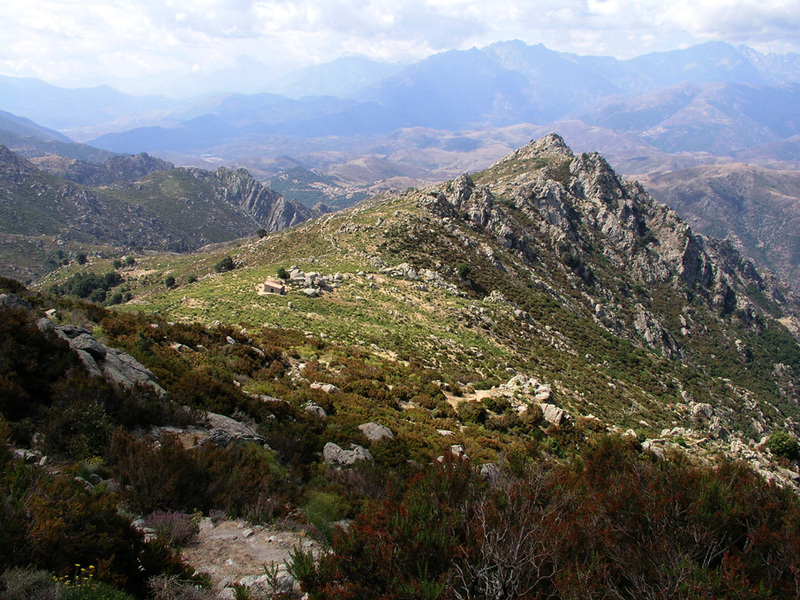 N197 from I'lle-Rousse merges with Hwy. N193 from Bastia to Corte. Go north from Ponte Leccia on N197 about 14 km and locate the exit marked Lama going right (east). Head up the hill to Lama, after 3km you should be very close to the local church. Make a sharp right turn before the church, then go straight in the next intersection (where a small road forks left). Continue uphill as the road turns back and climbs in the hillside above the church. Note when you reach the highest point of the road and find parking on the right side (below some small cliffs) along the next 30-40 meter. This is the trailhead, elevation 545 meter, location N42:34.594, E009:10.389. If you drive as far as to the next narrow passage with a building on the left side of the road you have gone too far. Route description: From your parking, walk a few meter further along the road to the narrow passage where the road is squezed between a building on the left and the rock on the right. The road also has a small local "hilltop" in this location. On your right, there is a large information sign describing the trail. Also note that there is a warning about a poissonous plant (Urticante? ), that one should not touch, for this reason it is recommended to do this hike with long pants. The actual trail starts out up the steps immediately to the left of this information sign. Continue on the left side of a building and turn right onto a somewhat broader trail that will take you up and around a small concrete water tank. From here the trail is very well made and easy to follow. The trail continues uphill making many turns while gaining elevation. A lot of man made work with supporting stone walls makes this trail a very nice and memorable walk. On the top, the trail levels off and traverses a gentle slope while turning a bit more left as you go. You will now approach an area with several man made stone fences, just as you pass below some large trees (chestnuts? 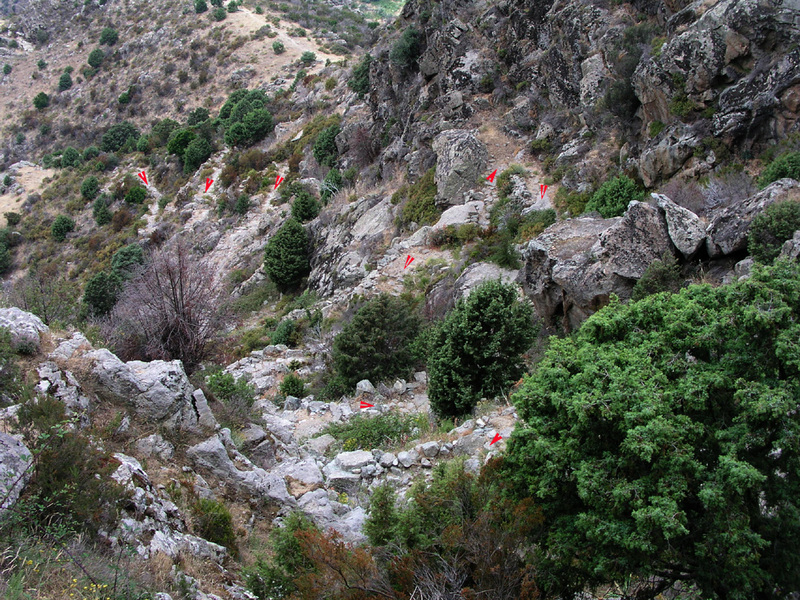 ), pay attention and follow the trail that heads uphill to your left, just on the upper side of a stone fence. Do not follow the trail that enters through the fence (I did and subsequently lost the trail). The trail stays outside, but next to the stone fence as it climbs the hill and reaches the crest. 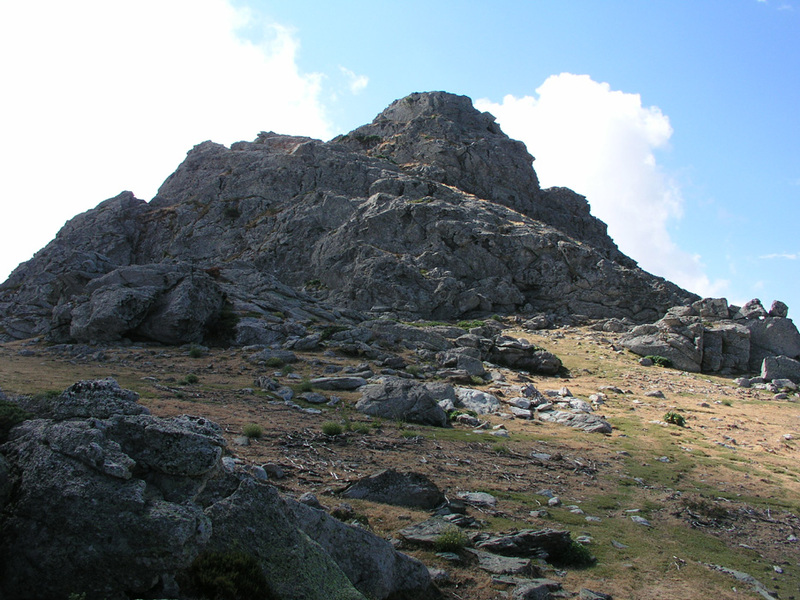 From here, continue more or less along the ridge to the refuge called "U Prunicu". This refuge was locked and closed when I passed it on my way down. This refuge is at 1065 meter, location N42:34.928, E009:11.494. The route continues towards the ridge above, but traverses a bit left and initially climbs on the left side of the ridge. It is generally marked by small cairns and fairly easy to follow, however, much less developed than the first section below the refuge. Higher up, the trail reaches a level area and the final summit block comes into view a bit further away. Cairns again provide clues as to where the (easiest) route runs. One can also scramble up more or less directly. 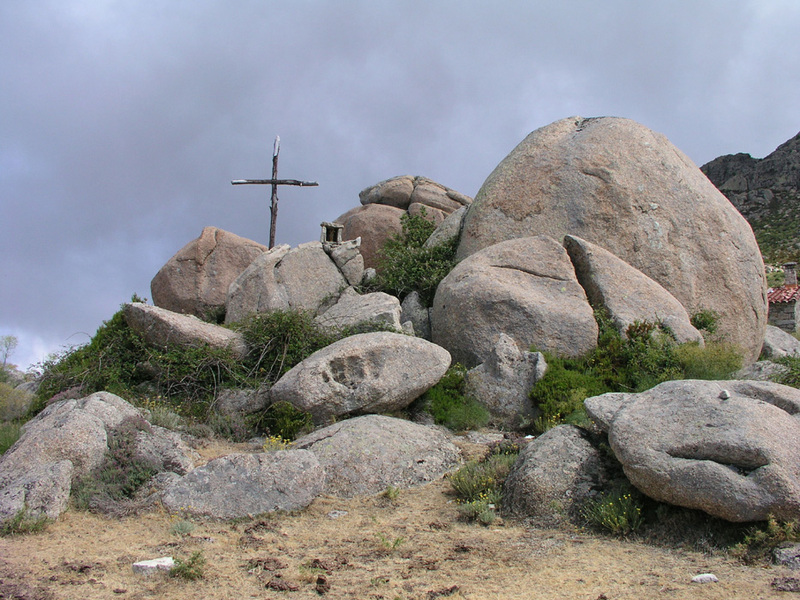 The summit is a nice grassy area marked with a large wooden cross. 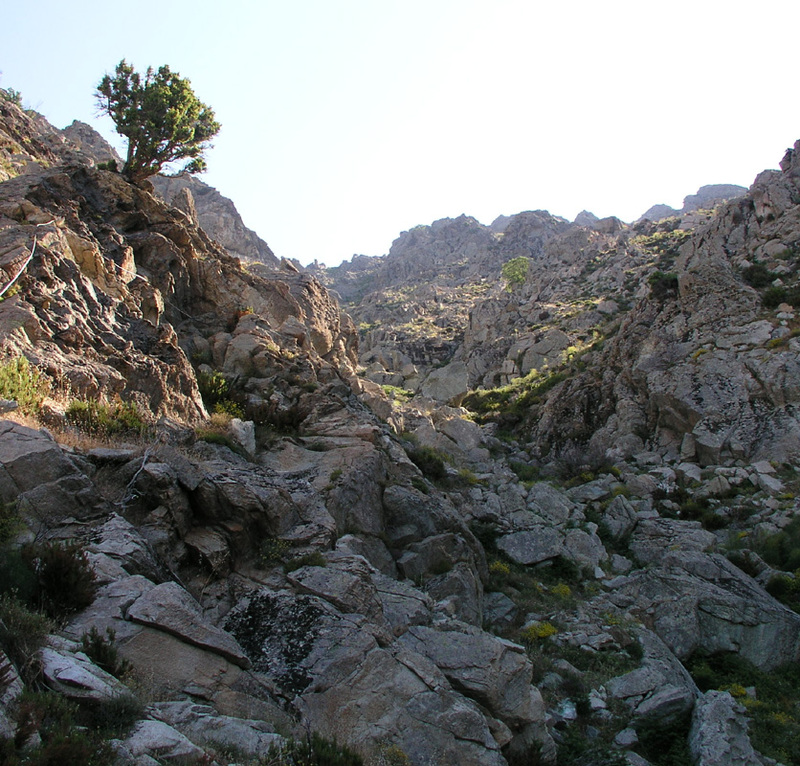 Comments: I started from our hotel in Piana at 0520, determinded to complete this hike earlier than the two previous ones. Arrival in Lama around 0800, started hiking at 0810. I took a wrong turn (too much right) just after the big trees and ended up going straight towards the mountain and "bushwalked" up the very distinct gully that cuts the mountain face. 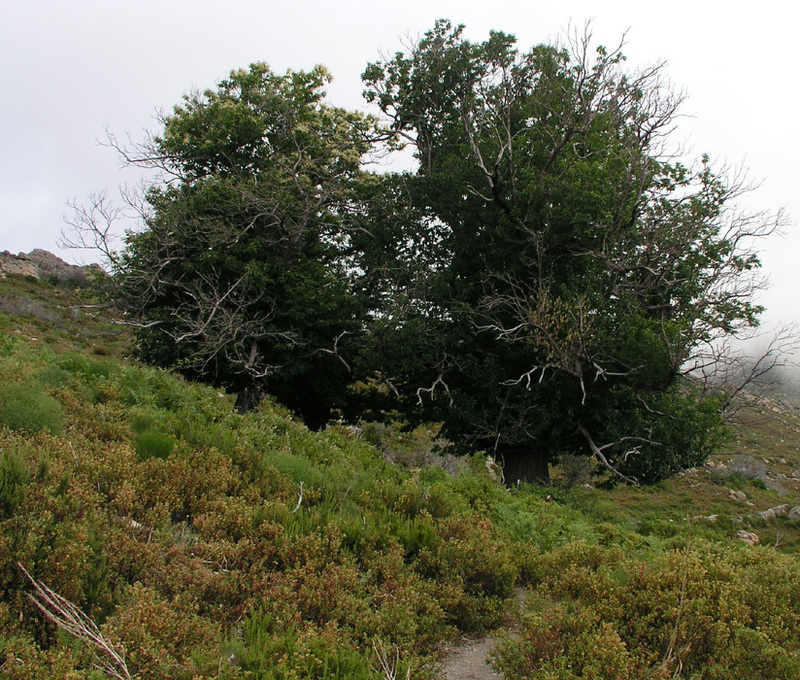 Despite some unpleasant terrain I still arrived at the summit plateau at 1010, two hours. After spending 20 minutes on the top I started descending and ran into a group of local hikers about 100 meter below the summit. They did not come from Lama, so there are alternative trails. After a nice 10 minute chat, I continued down, this time following the proper trail. The descent took 1:20, thus arriving back at the car at 12:00. Just below the church, on the right side when heading downhill, is a nice restaurant. It seemed well deserved, the entrecote and beer that completed my nice visit to Lama. The drive back to Piana went smoothly and the swimmingpool felt just right at 1500. 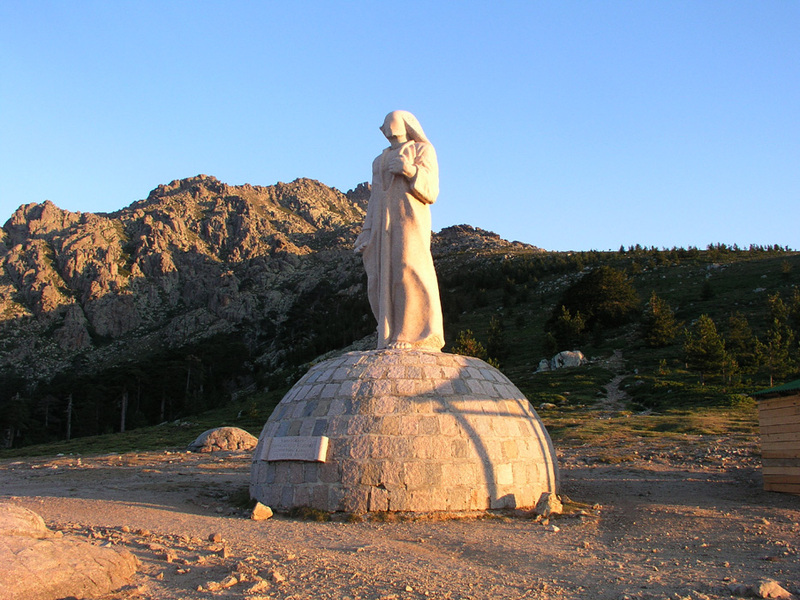 The M5 trip continued the next day with ascent of Monte Cinto..
Sunrise at Col de Vergio, 1477 meter. Information at the trailhead in Lama. Off route, I ended up climbing this gully. 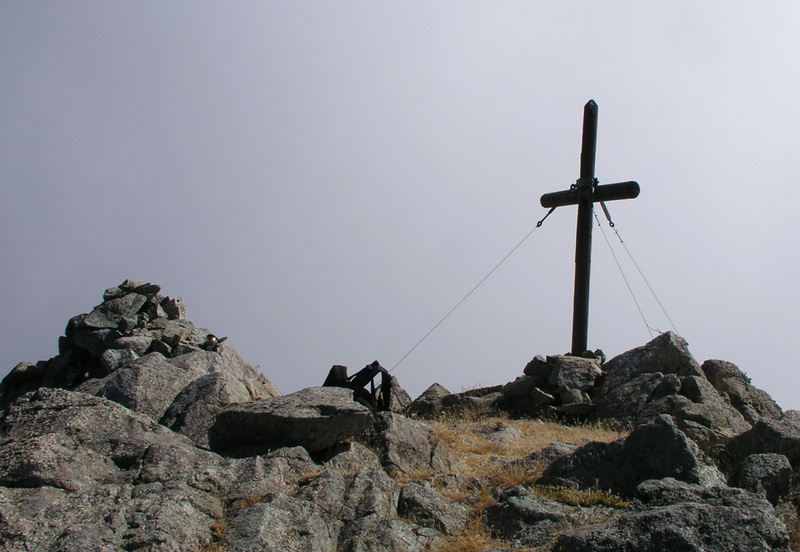 The summit cross on Monte Asto. Summit panorama I from Monte Asto. Summit panorama II from Monte Asto. 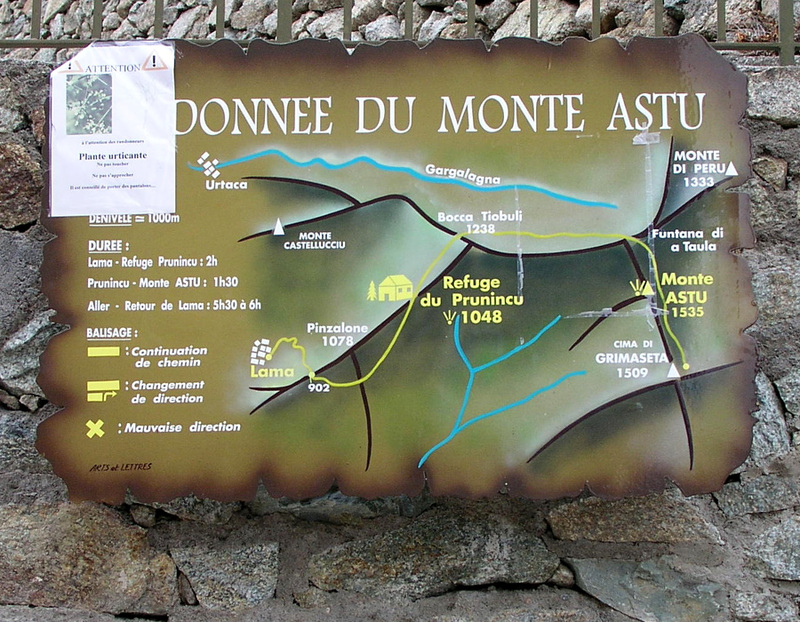 The refuge on the ridge below Monte Asto. Religous symbols near the refuge. The trees, when the trail goes through here, keep left (uphill) on the other side. This is where I lost the trail. The trail, ascending from Lama. It is well built. 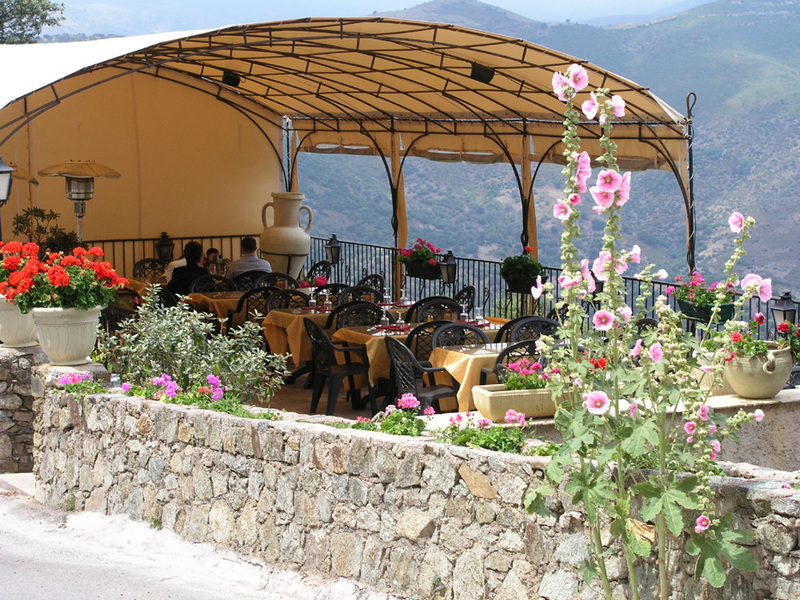 The restaurant in Lama. A good lunch after a nice trip. View west from Evisa. Golfe de Porto and the canyon. Between Evisa and Porto. This canyon is very impressive. The three peaks in the middle reminded me of the famous three sisters in the Blue Mountains near Sydney, Australia. 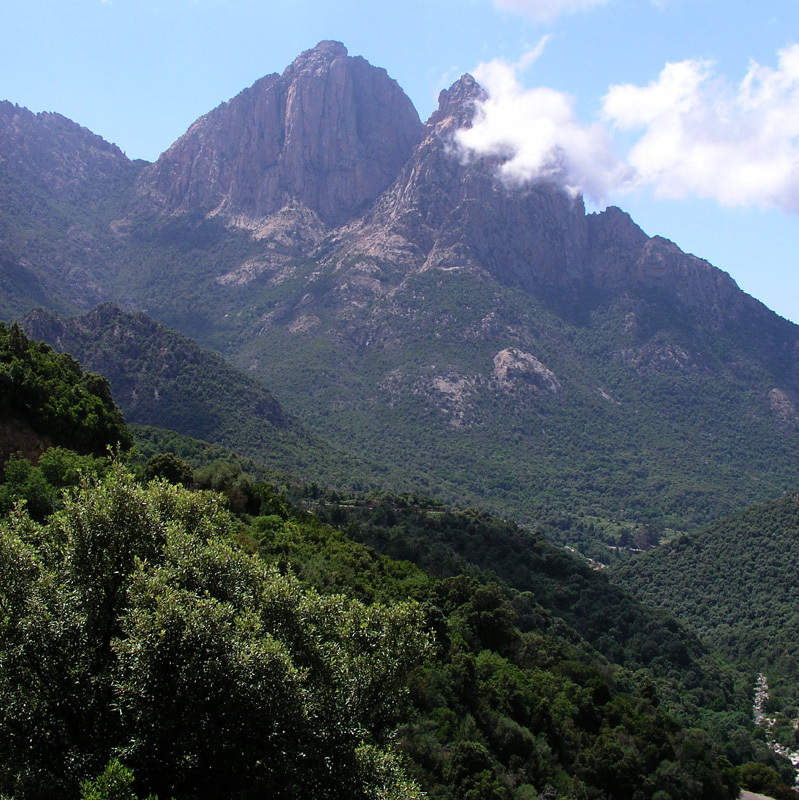 Capo d'Orto between Porto and Piana.